LPG Hazchem Transport Panel Halves. 2 separate stickers as a pair. Please enter your specialist advice in the text box. Select over-laminate for extra protection and long life. It also makes affixing the stickers WAY easier. Use this LPG Hazchem Transport Panel Halves on Tankers with a rear area too rounded for the normal 800x600mm sticker. We supply this in two halves. We have many EIP signs in our store. National Safety Signs is located in Southern QLD (Gold Coast) and ships all over Australia. We have a fast turnaround time and supply quality signs. We can basically manufacture any sign you need, even you business name and advertising. 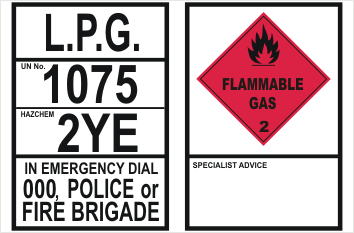 This LPG Hazchem Transport Panel Halves is only available as a pair of stickers. We recomend you select ‘laminate’ as extra protection and added life in the harsh outdoors.